When it comes to content marketing, many say longer content is better content. But this isn’t always the case. A longer blog post word count could boost the performance of your SEO and content marketing efforts, but the results largely depend on what you are trying to achieve with your content. Here’s how to determine the right word count for content marketing to match your marketing objectives. Some say the more words, the better your content will perform. This is based on the fact that online users prefer in-depth content that thoroughly covers a subject and adds value to the user’s experience. While it’s certainly true that web users appreciate good information, it’s worth stepping back and considering if that is the endgame of your content marketing? Businesses might consider answering a different question first: What are you trying to accomplish? It turns out that different content lengths are better suited to different content marketing and SEO marketing goals. This makes sense because not all customers are the same, not all business models are the same, and not all content marketing strategies are the same. So why would everyone have content that’s 2,500 words long, as the conventional knowledge goes? Here’s another look at this question considering your primary content marketing goals. For a marketing strategist with a primary goal of pageviews, short content isn’t as bad as you may have been led to believe. Yes, it’s true that Google’s Panda SEO algorithm dislikes very, very short “thin” content, but above around 300 words, a strong piece of content shouldn’t be penalized by Panda. As far as the data, consider this HubSpot post on character count. The site’s data showed posts of 2,250 to 2,500 words received the most organic traffic. 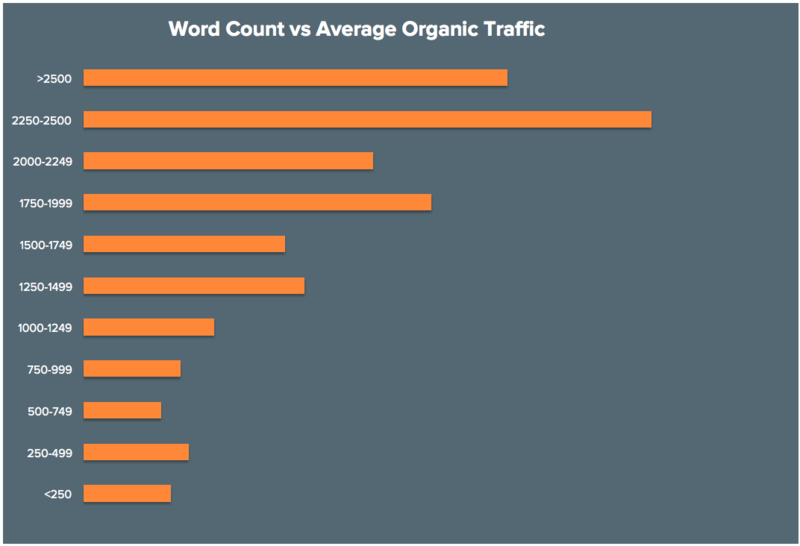 However, the same chart shows 250-to-499-word HubSpot blog posts out-performing the next two word-count categories. 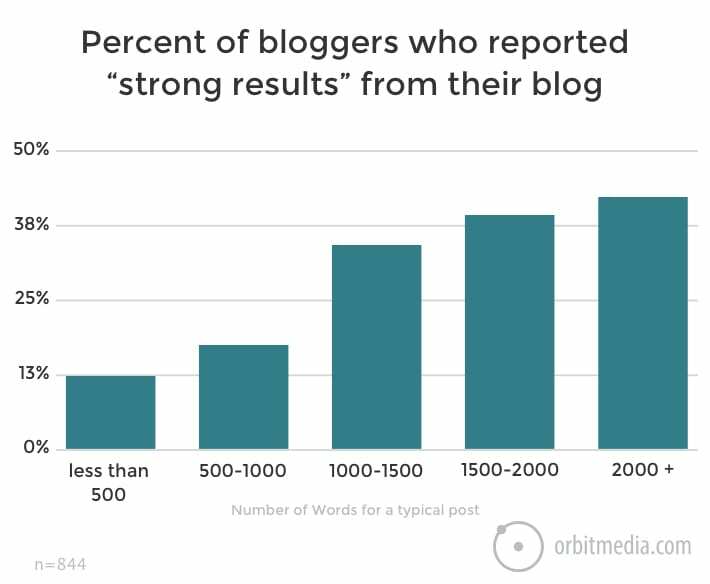 In another piece of research, 13% of surveyed bloggers told an Orbit Media survey that they obtained “strong results” with posts under 500 words. And an informal Twitter poll of marketer Tim Brown’s thousands of followers showed 27% preferred 300-700-word posts best. As far as blogs of note, marketing guru and tech thought-leader Seth Godin is the first to come to mind. Godin’s short daily posts have most certainly helped, not hurt, his content marketing strategy. Moreover, it’s important to remember that many static web pages fall into the 300+ category. For many firms, FAQ pages, product pages, and about pages don’t have thousands of words of content — and they work just fine. For your typical, everyday SEO, branding, and content marketing purposes, content marketing pieces between 500 to 1,000 words is likely ideal for most companies. This is long enough to cover most blogging topics with enough detail to add great value to the experience of your readers, earn social shares and comments, and please Google’s search algorithms. For data, this was Tim Brown follower’s most popular pick, with 51% approval. Around 17% of Orbit Media bloggers also preferred this length, and posts of between 800 to 900 words were the most popular with that group over the last few years. Additionally, an internal dive into blogging platform Medium’s data showed that three-minute reads (about 900 words) have the most views. Also, it’s worth noting the practicality of 500-1,000-word content marketing. For your small internal team or your outside agency partner, this is a great length for pleasing all parties and brand audiences. SEO marketers can also work their keyword targeting magic with a steady stream of posts of this length, which is great for pleasing Google. If your content marketing goal is engagement with your content, then there’s a good argument to be made that about 2,100 words is the right length. At this word count, we are well into long-form content. This is a longer time and resource investment on the part of your business and a bigger investment on the reader’s part as well. Going back to Medium’s dive into their internal data, the blogging platform revealed that this length was the optimal post length. 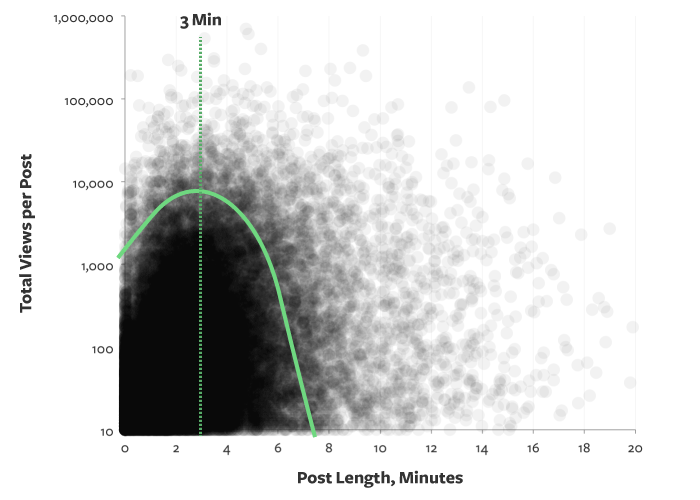 Medium defined it as “the seven-minute post,” which we can calculate to about 2,100 words considering the average reader can cover 300 words per minute. Data showed that the average time spent by readers increased as content got longer, peaked around seven minutes, then declined. For HubSpot, this content length earned the second-most social shares, behind content longer than 2,500 words. Of course, you could push your content word count even further — and considering the ROI, you just might decide to do so. It turns out that ranking in the SERPs (Google’s first search engine results page) for very competitive keywords takes carefully targeted, high-quality, long-form content — about 2,500 words worth. Data by serpIQ shows that the average content length of top-ten Google results belongs entirely to content over 2,000 words. According to this data, the top three search results in major categories for competitive keywords were consistently just under 2,500 words. Even the tenth ranking result averaged just over 2,000 words. The serpIQ data matches with HubSpot data that showed this length earned the best organic traffic. Of course, not just any few thousand words will earn your brand a top-ten SERPs ranking for competitive search terms targeted by millions of pages. Your long-form content has to be good, and such quality content can require a surprising amount of resources. 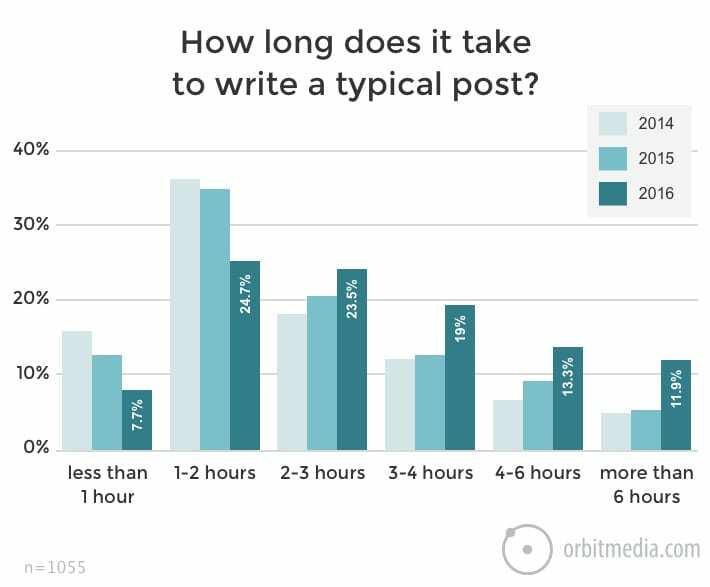 The Orbit Media survey found that the average blog post now takes three hours sixteen minutes to compose, a 26% jump over last year’s results. Results show that more than 45% of bloggers are spending three, six, or more hours on a single piece of content. Around 12% are spending more than six hours. One solution to this resource problem is to do a combination of content lengths, several short pieces and one longer piece per month. Or, you may find that a volume strategy, paid media strategy, or other tactic works better for your particular needs. In the end, the right content length is the one that works for your business, your customers, and your SEO and content marketing goals. The internet is filled with a wide variety of content lengths, and one of them is just right for you. Have questions about your brand’s SEO and content marketing word count? Call us at 313-338-9515 or email hello@kaleidico.com to learn how our full-service digital agency can help.